HomeOnline Training Is About To Reach New Levels! As we start the downhill slide toward the end of 2017, I have to look back at the things that I have accomplished over the last 8 years with Green Phoenix Farms. Overall, I think that the most wonderful times I have had are those where I was leading a Class or Training Workshop. I mean, teaching is just something that I LOVE to do! Now, in today’s world, we all know that free time has become something of a fantastical concept. I mean really, who actually has free time anymore? There is always something else that needs to be done for work, or the kids have a school/sports event, or there is a friend’s birthday, or something.. The sad truth is that most of us just don’t have the time available in our schedules to go to a comprehensive Training Class or Workshop. So, that is why I have decided that Green Phoenix Farms is going to start a brand new chapter in our vision of what education can be for our industry. Specifically, I have decided to move forward with the expansive process of adapting all of our curriculum for Aquaponics, Hydroponics, Aquaculture, Greenhouse Design, and DIY System Construction into an easily accessible and available format. That is right — I said 100% of our existing curriculum (and several more that we are just beginning to plan out…) will be adapted to an on-demand online format. Now, I will the the first one to tell you that there is no substitute for actually being face-to-face with an instructor, and having the opportunity to learn hands-on. The sad fact is that there is a good chance that you (like many working adults) do not have the time OR the financial resources to attend this type of training, and until now that has meant that you were very limited in what options you had to learn Aquaponics, Hydroponics, and everything else related to Controlled Environment Agriculture. 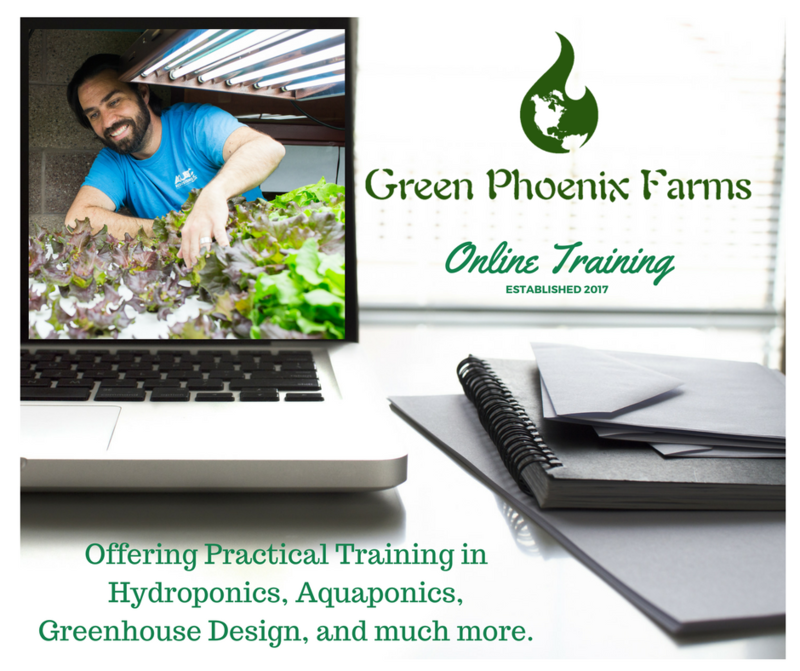 I am proud to announce that Green Phoenix Farms is now offering two FREE Webinars to kick-off this launch. The first Webinar is on Hydroponics, and will walk participants through the steps needed to create custom nutrient solutions from scratch. The second Webinar is on Aquaponics, and will kick off a larger series on practical small-scale aquaponic system design. Click the links above to register for both Webinars, I hope that you come take a look at what I have to offer, and I look forward to seeing you there! As I develop our new platform, and transition my curriculum, I want to ensure you that my goal is to provide the absolute highest quality information that I can. This process has only just begun, but I can promise you – You ain’t see NOTHING yet!